It looks like Eurodollar is finishing its correction; bulls have almost reached level of 50%. If market is able to keep price below 38.2%, pair will start new descending movement. 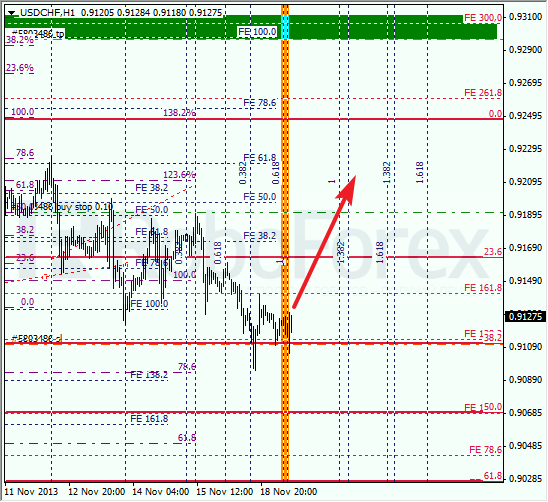 As we can see at H1 chart, one of the latest peaks was right inside one of temporary fibo-zones. Probably, in the nearest future price may reverse and start falling down. After formation of the second peak, I opened sell order, keeping pending one too. Franc rebounded from 38.2% twice. Possibly, price may start growing up again in the nearest future. Target is still in upper area, where there are several fibo-levels. The second rebound from 38.2% took place inside one of temporary fibo-zones. Later pair is expected to start new ascending movement; I’m keeping my pending buy order.